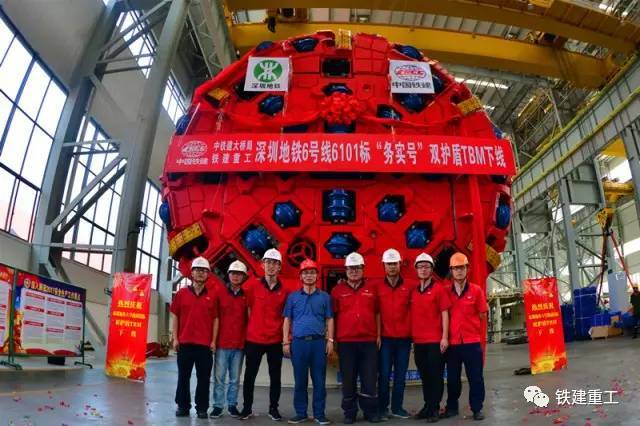 On August 4th, China Railway Construction Heavy Industry Co., Ltd (CRCHI) completed the production of a 6.47m diameter double-shield TBM, after spending just 5 months in the machine’s design and manufacture, saving – according to CRCHI – two thirds the time a TBM of this size would usually take to deliver. This is the first double-shield TBM produced by CRCHI to be applied in a hard rock subway tunnel. The machine will be deployed on Shenzhen’s Metro Line 6 Section 6101. Shenzhen Metro Line 6 is located in the city’s Bao’an District. Although this section is only 3km long, it traverses several fractured formations. The rock has a compressive strength as high as 100MPa, which is rare during metro construction in China. To cope, CRCHI set up a research team and cooperated with the China Railway Major Bridge Engineering Group Co., LTD, Shenzhen Metro Corporation, China Railway Eryuan Engineering Group Co., LTD among others. The TBM has two modes: single and double shield. It can switch modes within the range of 30MPa and 200MPa and is highly adaptive to changeable formations within the hard rock. The TBM is due to start tunnelling in October 2017.